12/1/09 - 1/1/10 | sweet juniper! One kid sits in the backseat and tells her parents it won't be winter until there's snow on the ground. "I can't make it snow, kid," her dad says. Having grown up with the constant annoyance of lake-effect snow, even if he could, it's unlikely he would. They are driving west across the state, back to where he grew up, and when they cross that line where the snow stops and starts, where the grass in the highway median disappears and the pine boughs are draped with the last hurrah of the latest storm, the boy in the back seat (who has no memory for snow) looks out his window and says: ice cream. This is what it means to be a bit shy of two: the world is still amazing enough that you might suddenly find it covered in ice cream. For a lark he snaps up some mistletoe at the farmer's market. He ties it just above the third step of the staircase, telling his daughter, "When you stand under the mistletoe, you have to let someone kiss you." Just shy of five, she misinterprets this to mean she cannot pass under it without a kiss, as though the sprig were some enchanted object right out of her fairy stories. For a week, she will not go up or down the stairs without pausing there under the mistletoe, waiting for someone to notice, silent, longnecked, lip-pursed, anticipating the kiss that will grant her passage. The snow finally sticks around their house on the sun's shyest day. By the time they're all swaddled in snowsuits and wool, the sun's long gone so they wander around their neighborhood by streetlight, looking for the best Christmas display. Though the salted sidewalks are clear, both kids choose to walk off the path, the snow crunching under new boots, the dog's tail swatting their polyester armor. More snow is falling and people like this might forget that the winter is long, and cold, so long as there are moments like this to help them survive it. "Watch it, Red," he says to the woman who has pelted him in the back with a snowball, her arm cocked with another. His daughter, cackling, attempts to throw a powdery clump that turns to snowdust before leaving her grip; still, he spirals backwards and feigns injury. His son piles on top of him, and their laughter cleaves the silence of this night. This year we really had it together (and by we I mean my wife); in the past, December would sneak up on us and we'd rush to take a bad family picture and then print it off quickly at the nearest chain drug store to get something in the mail before the holidays. 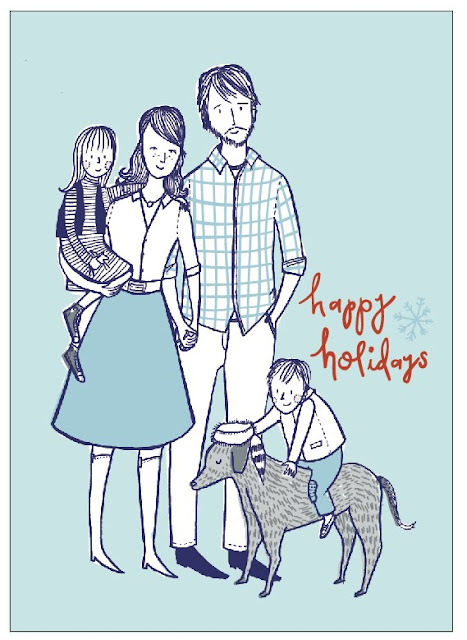 This year my wife saw the doodle Samantha Wedelich at dwelldeep did of me holding the kid after she fell asleep at a dinner party back in August and hired her to do the art for our 2009 holiday card. 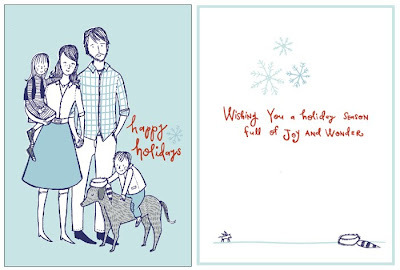 They corresponded for a few weeks and we sent Sam a dozen family photos (including the dog). This is what she came up with, and we were blown away when we saw the final artwork back in November. We asked Sam to do the text on the inside as well. Isn't her handwriting beautiful? She added the boy's beloved coonskin cap (from Fort Ticonderoga) and the girl's Pegasus toy. When we received the finished product in the mail last week, we were blown away all over again. Sam did the printing and it's exceptional (and the kind of thing I would have done cheaply by myself, so I'm fortunate to have a wife who controls the purse strings and makes unmiserly decisions sometimes). Next week we'll share the handmade presents we're making for the kids. This latest book to rise to the top of the thrift store discovery pile is a heartwarming little self-published (but underwritten by an insurance trade group?) tale of a boy who discovers that his father's career selling insurance is much more exciting than he previously thought. In the original version, the father is there to save the day wherever tragedy strikes, sort of a superhero in Stafford slacks. In my parody version, he's more like a bloodthirsty pirate in Stafford slacks. The truth about the insurance industry (I learned after years of litigating bad faith insurance case) probably lies somewhere in between. Note: this is parody of the original text using the original illustrations. 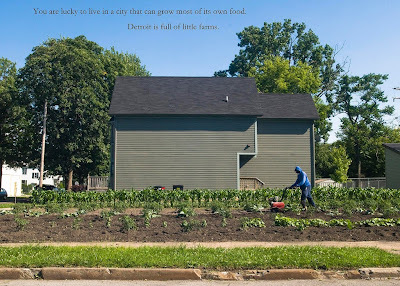 This is the second in a series of posts responding to the idea that there is nowhere to shop where we live because so little national retail exists in our city (read here for more details). 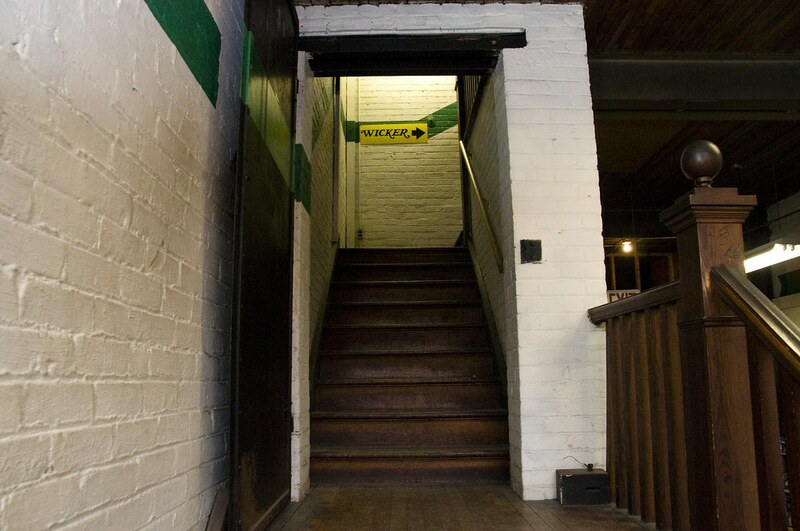 I never gave much thought to what was on the second floor of R. Hirt Jr., right above the spot where I've ordered dozens of pounds of cheese, cured meats, bacon, eggs, butter, and paid for many hundreds of gallons of milk over the years. Hirt feels like an old-fashioned store because it actually is one: the layout seems not to have changed much in more than a century that it's spent at this location. But I don't have a true sense of this history until retail manager Judy Jagenow takes me on a tour upstairs, past the "employees only" sign and about a hundred years into the past. "This is the apartment where the original Hirt family lived," she says, leading me through rooms with faded and peeling Victorian wallpaper that's been stuck there since 1890 when the building was built. 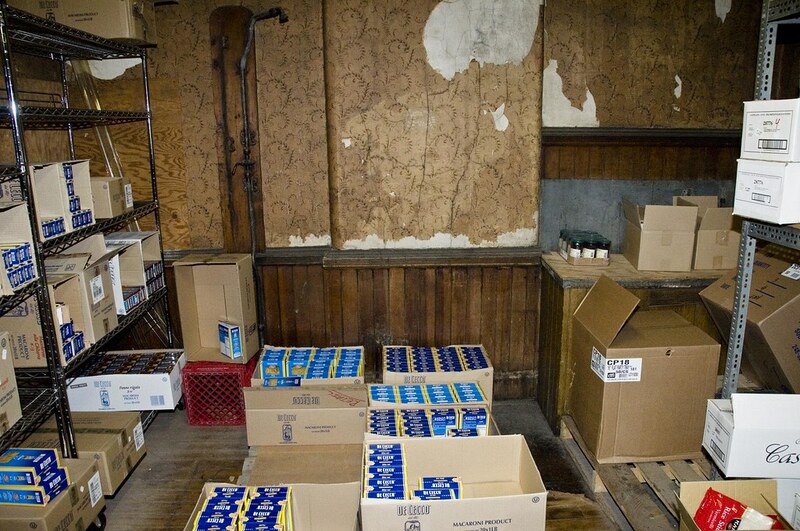 Looking past the boxes of imported olive oil and pasta, you can see what is left of the apartment where Rudolph Hirt, a Swiss immigrant, and his wife Anna raised seven children and built one of the few Detroit businesses that would survive from the nineteenth century into the twenty-first. There are places where the plaster is peeling away and latticework is visible beneath. There is a hard-earned, honest patina to the place. Seven children were raised here. 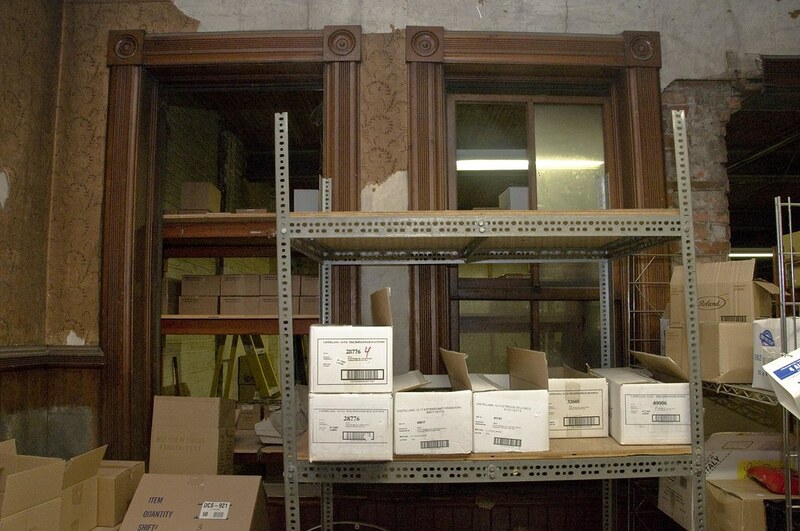 You almost expect to see notches marking their growth carved at varying heights along the original moldings that remain around the doorways; the moldings remain even around the windows that once marked the rear of the old store but now sit within an interior wall of a building extended well beyond its original shallow footprint. "We ripped out a drop ceiling only to find another drop ceiling," Judy tells me. "When we ripped that one out we found the original tin ceiling. It had been singed by smoke from a fire back in the early days. The story goes that while he was escaping the fire, Mr. Hirt grabbed what he thought was one of the babies but it turned out just to be blankets, so he rushed back in and saved her. Both were burned, but she lived to an old age." This story of this family living above their store appeals to me, though such an arrangement was not at all uncommon for the time. 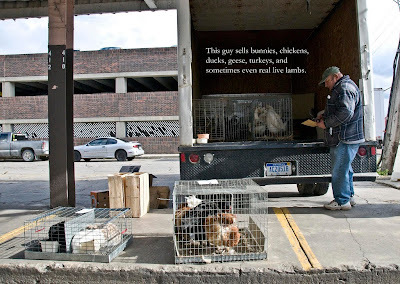 The Hirt building lies just west of a number of slaughterhouses; I've read that in the early days, livestock that hadn't been killed were kept in pens on the roofs of the buildings. There was once an Italian grocer next door (that building burned down in the 1980s) and a German dancehall on the other side. It is hard to imagine such a time in our city, and the fact that this apartment survives makes it all seem so much more real. Judy tells me that her grandfather would take the same route she does to work, driving his cattle from his farm in Mt. Clemens all the way down Gratiot Avenue in the days when the Hirt building was still new. 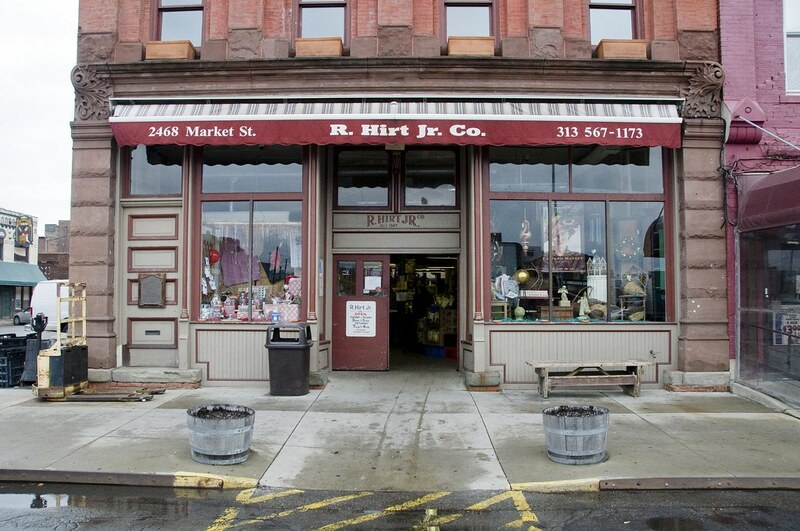 The Hirt family's business traces its origins back even further than the building itself, to 1887 when Rudolph invested his life savings in a stall that sold butter, eggs, and dairy products at Detroit's central market. The stall proved lucrative enough that the dairy merchant built the current ornate red-brick Romanesque building for a new store with his own name carved into the stone at its gable. "R. HIRT JR."
"There was no R. Hirt Senior," Judy tells me. "There was another, unrelated R. Hirt in town so he just added the 'Junior' to distinguish himself for the postman." 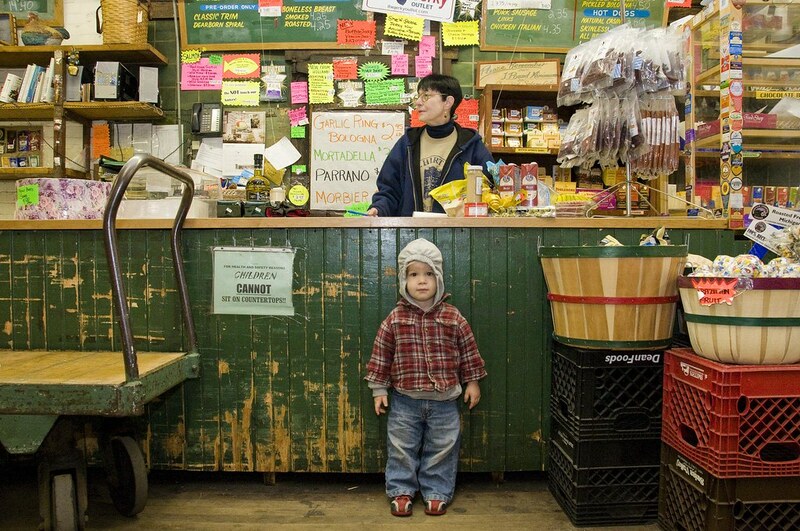 122 years later, there is only one Hirt in Detroit (and it's this store, not a man). This store still draws in crowds of people from the suburbs every Saturday. 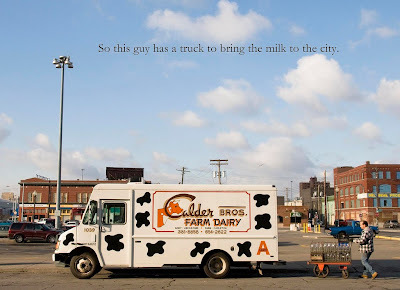 I shop there during the week, usually on Thursday morning after the truck arrives from Calder Dairy with all the sorts of things Rudolph Hirt would have sold at his original market stall: farm fresh eggs, freshly-churned butter, sour cream, cottage cheese, and (starting in late October) egg nog. I come in with a bag full of empty bottles and exchange them for cold ones with white-caps filled with natural milk (pasteurized, but not homogenized). During the week, the lines are less hectic than on market Saturdays and it gives me a chance to talk to and get to know nearly everyone who works there. They've watched my kids grow up and they know exactly what kind of cheese to give them when we come in to keep them busy while I order. If there's anything Hirt is known for, it's cheese. And if you want some, the minimum cut is a pound. At the cheese counter there's a 7-page list with more than 300 varieties from all over the world. 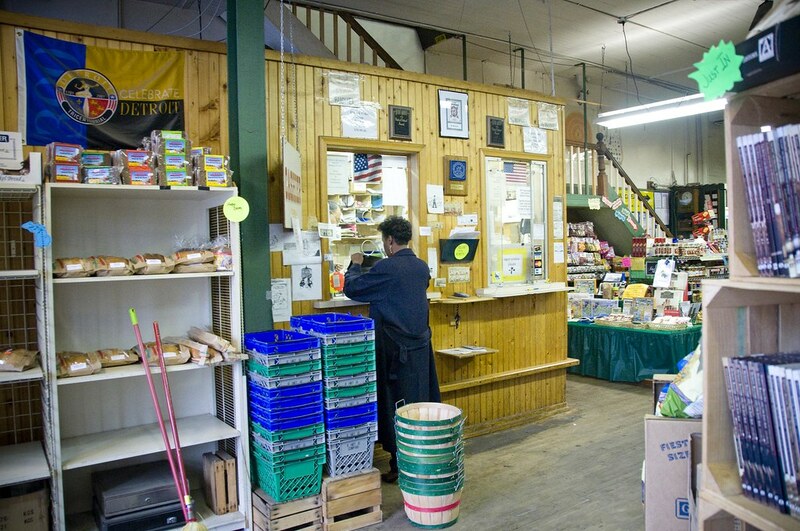 Hirt's cracker department is practically larger than all of Murray's Cheese Shop in Greenwich Village (Hirt has also been around half a century longer than New York's oldest cheesemonger). As the major cheese wholesaler in Southeast Michigan, Hirt's retail store gives walk-in customers access to the same cheese selection as the restaurants and caterers who buy cheese by the 10-pound wheel. And at the counter you can ask for samples of nearly any cheese, domestic or imported. I once made the mistake of standing in line behind a French couple who sampled several dozen cheeses from their native land, grunting to each other about the fruity aftertaste of the Pavé d'Oc or arguing whether the Camembert was too ripe before placing a sizable order. The store even has a francophone employee for the Saturday rush. All this talk of cheese may seem like this is only a place for cheese snobs. But Hirt is refreshingly unpretentious. After cheese, their next largest department is wicker. 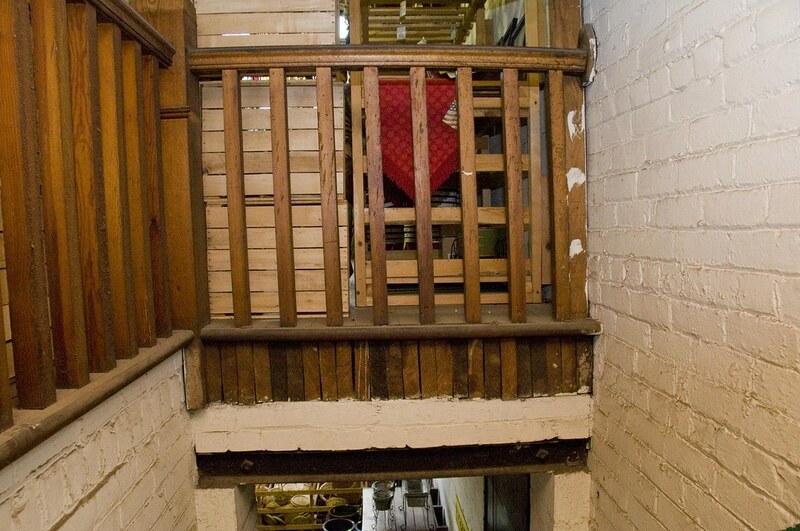 Seriously: the third floor is stocked floor-to-ceiling with wicker baskets. It's pretty hard to be a pretentious wickermonger, no matter how many stinky cheeses you sell. Nobody here looks down their nose at you if you want a pound of colby-jack or if you only want the domestic Parmesan (trust me, I know). I asked Judy if any of the cheesecutters are total cheese snobs, and she struggled to think of anyone who'd fit that description. "Not really," she said. "Cheryl knows the most about cheese, she's a real expert. But she doesn't buy a whole lot. Nobody buys all that much of it." I imagine spending your days cutting the cheese doesn't leave you with much if an appetite for it. Cheryl's been working here since high school (her mom was a cashier here before she was). Judy and Jan have been here 23 years. One of the ladies who works up in baskets has been there 21 years. "We do get some turnover," Judy says when I commend such loyalty. "You have to not mind working with cheese." 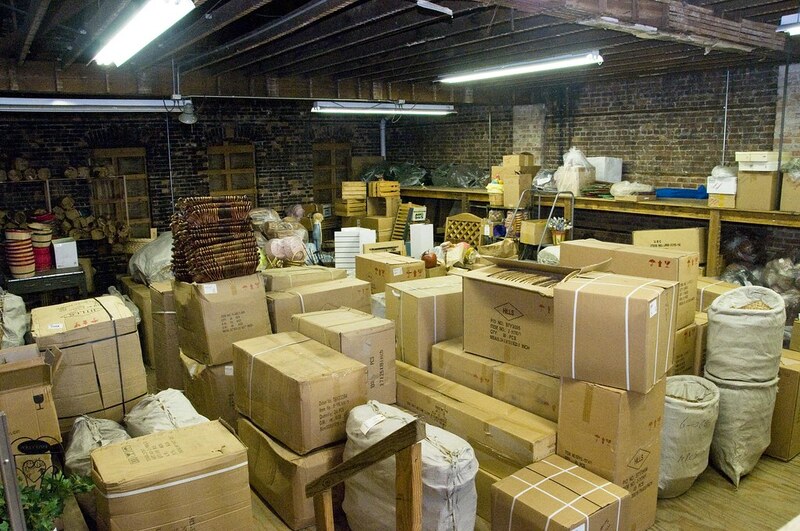 The store is still owned and run by members of the third and fourth generations of the Hirt family, mostly overseeing the warehouse operations and wholesale business. 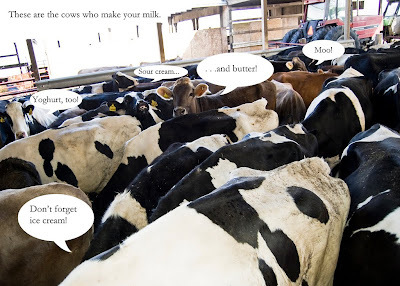 But it's not just dairy products. Every day, fresh baked breads are delivered to the front door. At the cheese counter you can also get pâtés, cured meats, sausages, jerky, ham, liverwurst, salami and other cold cuts, pickles, tofu, and sliced slab bacon. 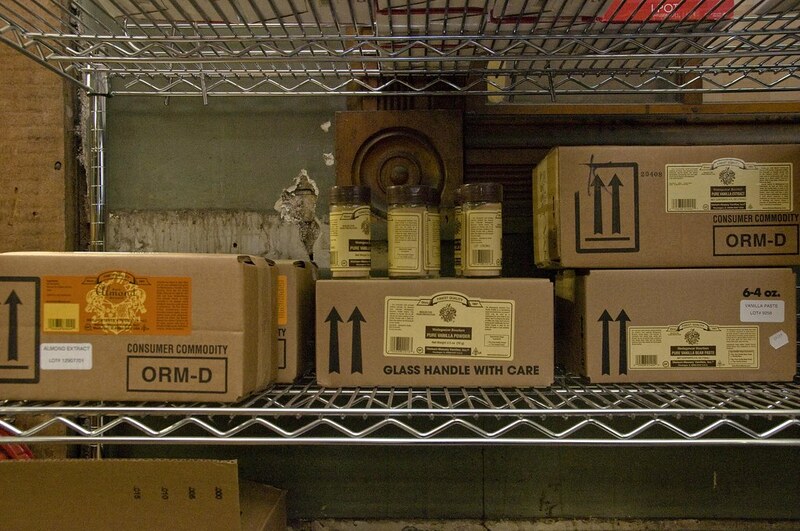 The rest of the store features specialty goods for which the company acts as a regional wholesaler. Without a grocery store in our neighborhood, we just go to Hirt. You won't find any products distributed by PepsiCo. Nestle, General Mills, Kellogg Co., Sara Lee, Campbell Soup Co. or Kraft Foods here (though Hirt was the first Michigan distributor of Kraft cheeses back in the 1930s). Though it's technically a specialty store, the prices aren't crazy. 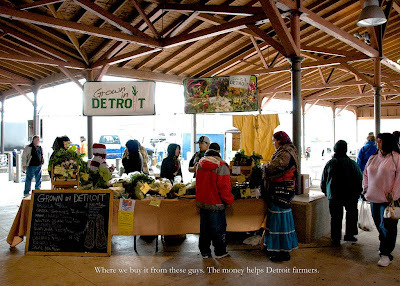 Those big conglomerates' products are more expensive at the independent "ghetto markets" throughout Detroit than they are at suburban bog boxes because independent retailers can't buy in the volume necessary to make prices competitive. Hirt doesn't try to compete with the big boxes, but instead buys unique and desirable products in great volumes to wholesale for other retailers in the region (and they have a huge warehouse just down the road or that purpose). 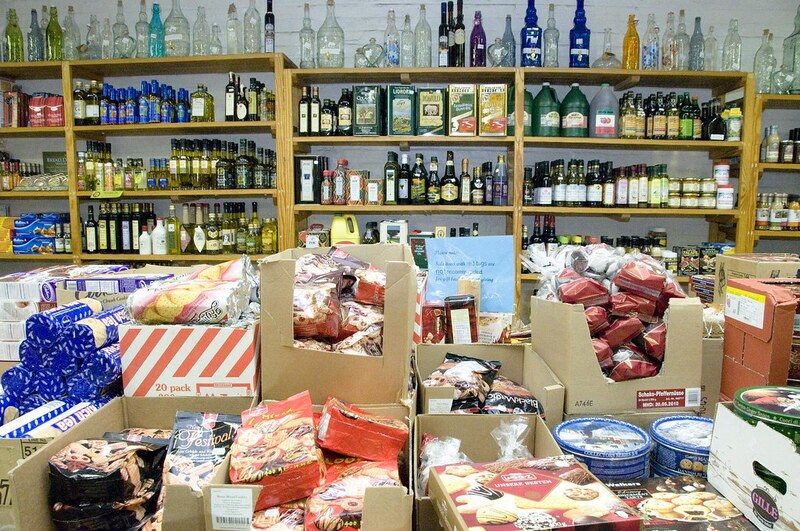 They focus on imported and locally-produced goods, but I can go there with a recipe and get just about everything I need, from beef stock to soba noodles; dried cherries to gourmet vinegars; water chestnuts to dried spices; gourmet coffees and teas. It's not one-stop shopping, but it's a surprisingly convenient and high-quality replacement. It's a frugal yuppie localvore's dream, and it's within walking distance of my front door. Every trip to Hirt usually involves some bribery. 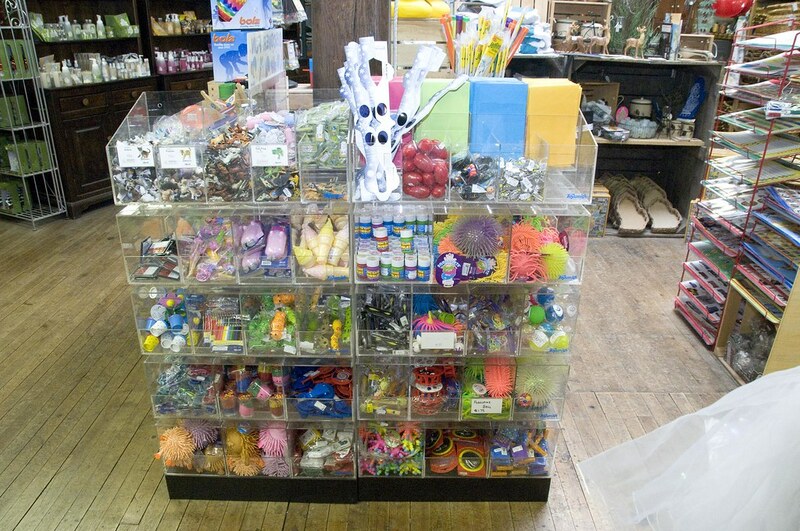 About a year after we started shopping there, we discovered that in addition to wicker, the third floor has a toy department, and my kids love picking through the bins of 50 cent toys that make great gift bag stuffers. You won't find Mattel or Hasbro or licensed Dora or Disney stuff here. 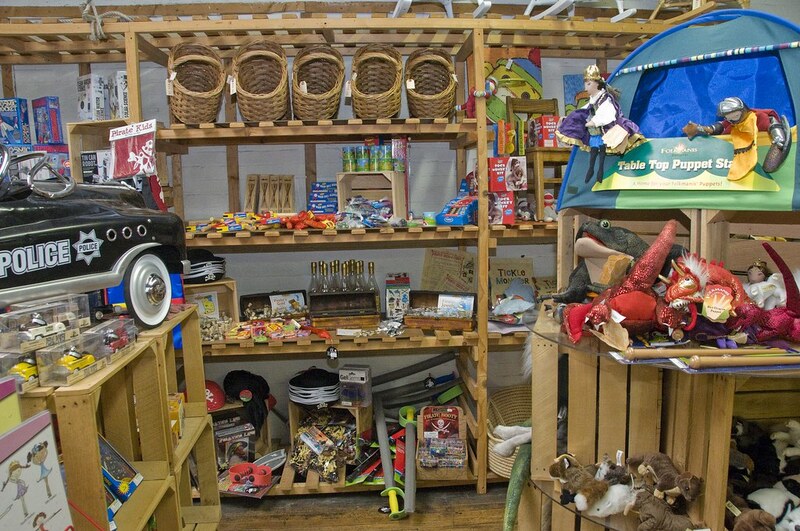 Most of the toys are well suited for imaginative play (this is where we stock up on pirate supplies), many are old-fashioned classics, and some of them are even American-made. 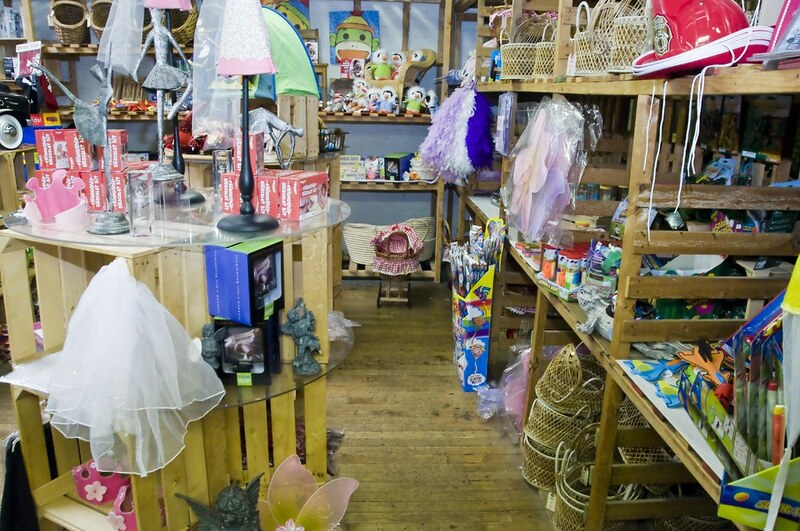 It's one of the best toy selections in the metro area and you wouldn't even know it's there. 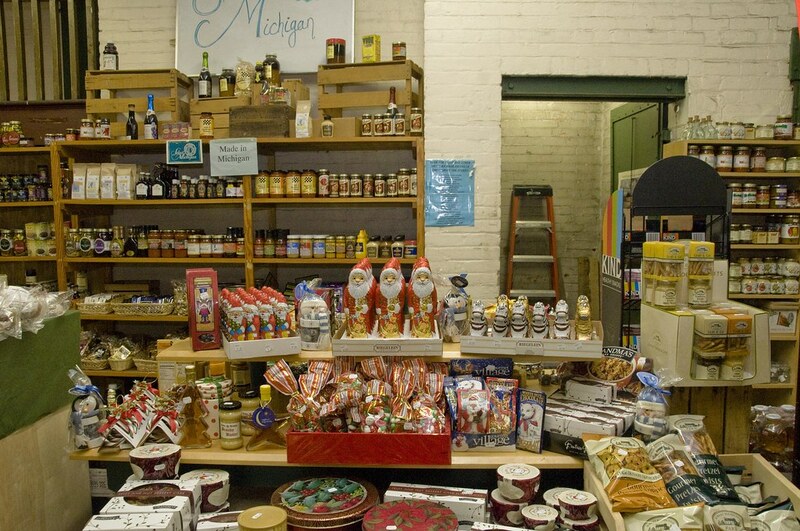 The third floor also stocks Pewabic Pottery, Michigan-made goods and souvenirs, jewelry and tons of handcrafted holiday decorations. 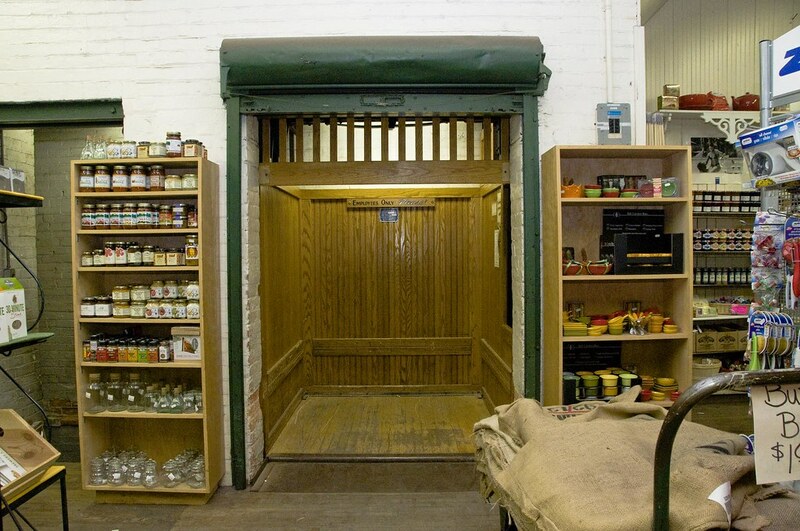 To get upstairs you can hitch a ride on the old-school rope freight elevator or take the century's-old stairs. And what I love most about Hirt are its quirks. The cheesecutter writes down the weight and price per pound your cheese on an old-fashioned bill-of-lading but she doesn't touch your money; she bags or boxes it up while you bring the bill over to the old cashier window, where another employee punches a million buttons on some old-fangled counting machine and writes down the price of each cut of cheese or meat and then adds up the total. Unless you pay with a credit card, there doesn't need to be a microchip or electrode involved in the transaction. You can tell the tourists from the locals by how confused they get checking out. I feel so fortunate to be able to give my kids the experience of shopping like this. 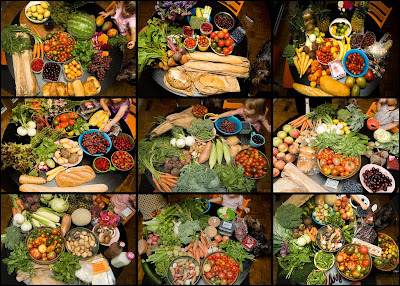 This is how everyone shopped once. We all knew the person behind the counter well enough that they could quiet your child down with a sliver of mild cheddar slid across the counter on a piece of wax paper. It may be cheaper to shop at the big box stores (where some have eliminated checkers in certain aisles, replacing them with bumbling computers). The jars of pasta sauce at the Costco might be bigger. But you certainly don't get as much. It's time for another contest and this one requires more than just a comment (that means your odds of winning are that much greater if you choose to participate). As you may have noticed, Shutterfly has been sponsoring this website through advertising for several months now and I couldn't be happier about it. 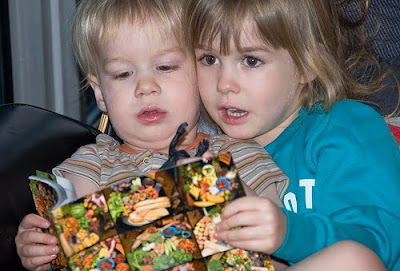 This advertiser offers a service that lets people be creative and give unique gifts and as I've written before, I really love creating personalized books for the kids. We make half a dozen or so every year, from gift books for the grandparents to photo "albums" to help remember vacations (even if it's just Cincinnati) to paper versions of the sort of silly projects I've shared here. Luckily, just before my laptop died I'd placed an order for a bunch of books to give as gifts this year, and one for the kids I've been working on for months. The books arrived a few days ago (and don't worry, I paid for all of them myself). 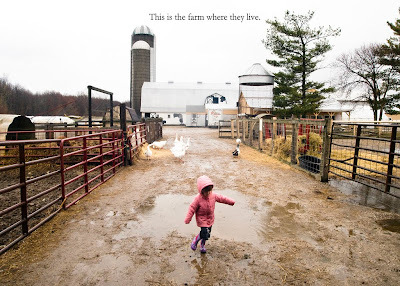 I wanted to create a book that would make the kids think about where their food comes from. Every Saturday morning we walk up to the big weekend market and it's become a huge part of our lives. All my resentments and frustrations about living here wash away on Saturday morning while I buy fresh produce and unique local products surrounded by other people from all over the area and from all sorts of backgrounds doing the same thing. 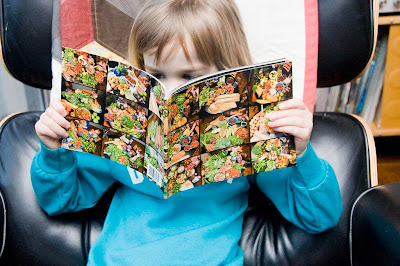 I know my kids will remember this tradition and I wanted to create a book that would both memorialize it for them and also help them think about how their food doesn't just come from Supermarket shelves. While you can use the Shutterfly software to add text, I'm accustomed to adding the text myself in photoshop before I upload the pictures. 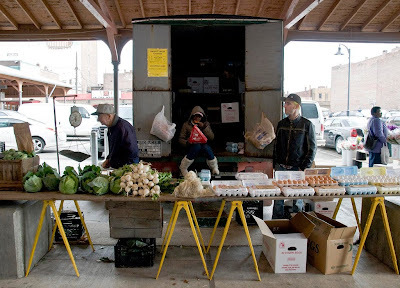 Sometimes I skipped text altogether and just included pictures of the market that I hope will help the kids remember how beautiful those mornings were. I also took pictures of all our favorite farmers. Today I'm offering the chance to make your own book and win a whole bunch of prizes from Shutterfly, including two (2) 7" by 9" photo books, 25 greeting cards, 25 stationary cards, and a photo calendar. I am sweetening the deal by adding a free gift basket of some of our favorite non-perishable Detroit goodies from Eastern Market for the winner. You have one week to enter (deadline: Monday, December 14, 2009 12:00 p.m. EST). To enter the contest, just create a book and add it to my Shutterfly community page. Your book can be as simple or as complicated as you want. It doesn't need to be a story, it can just be pictures. You do not need to share personal images or even order the book to be considered for the contest. 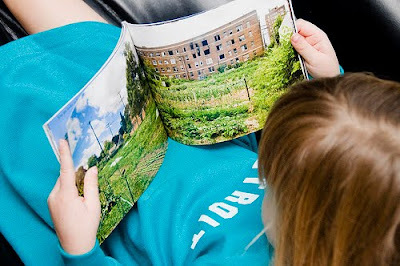 Shutterfly's website can easily help you make a book from images on your computer within a matter of minutes. It will be especially easy to enter if you've ever created something with Shutterfly before. Once your book is done go to my shutterfly page and click "add" to share your book with me and I will pick a winner at random from all books shared. I will announce a random winner on this site on December 14, 2009 (which I believe still gives you time to order and receive the free gifts before the holidays). I really look forward to seeing what you folks might create. Good luck. Several friends and acquaintances have recently announced their first pregnancies, and I find myself offering the usual pithy niceties and dull truisms, an aloof veteran patting the backs of the new recruits just before they hoist themselves over the top into the maelstrom of shrapnel and armament. Welcome to the trenches. I hope you don't mind the smell of human excrement. We spent part of last week at my mother-in-law's house. 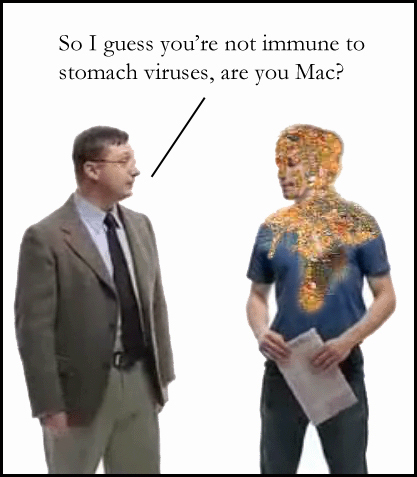 My son had a 12-hour norovirus. We share a room with him there and he vomited all over his bedding and portable crib and even after cleanup we fell back asleep in a room that smelled like the afterparty of the competitive fried-mozzarella-stick-eating championships. The next day I sit marveling at the premium-cable television stations my mother-in-law pays for on her giant flat screen, wondering if one day we too might enjoy television without constantly being interrupted by middle-aged men imploring us to try the simple capsule for natural male enhancement that increases the size of that certain part of a male body. My sick son is sitting on my lap and we are watching some movie I think is called Space Chimps vs. Monster Aliens and he coughs slightly and then vomits all over my shirt and pants. Under any other circumstance, if something you were holding started regurgitating yogurt-flavored stomach acid all over you, you might be inclined to drop it, or even toss it towards the CGI monkeys on the jumbotron across the room; instead, the thing is whimpering and so sick you hold it against your chest, comforting it even while confronting your own disgust, waddling towards the nearest drain where you hose yourself down along with this howling, parasite-lair of an offspring. The bug in my son's stomach passes into my daughter's, but I don't know that yet. The night before Thanksgiving she tells my wife her stomach hurts, but I'm in the other room on my laptop, tapping away as usual (when you ask my daughter what her father does for a living, she says he writes e-mails). I am focused on the computer while she hovers between sitting on my shoulder and the right arm of the lounge chair begging for some youtube video when she coughs slightly and vomits directly onto my laptop keyboard and the screen goes black with a brief reverb of circuitry within, then silence, a whiff of something electrical before the scent of this esophageal diarrhea hits us and she spews out a good bit more and the sight of it all sends my son into hysterics. 2 not capitalized : a wild uproar : tumult: a state of extreme confusion and disorder. 3 our living room after my daughter's vomit short circuits my laptop and I'm howling about it and dragging her and it across the room with reddish gloop oozing out of the USB ports. I didn't mean to do it, she shouts. I know, I say to her. It's not your fault. The kids holler until they're clean and calm. I can't find a screwdriver small enough to take the computer apart so the innards sit there marinating until a kindly neighbor offers up his eyeglass repair kit and I finally peel it apart to spend the next three hours with a box of q-tips swabbing foreign matter out the nodules and slots and sockets (I later learned it was strawberries). After midnight, I put it all back together and miraculously it powers up. I go into my daughter's room to kiss her goodnight and find her sweating under blankets. Her best friend has lately found other kids he'd rather play with at school, and in her sleepy state that's the first thing on her mind. Through her dream haze she says to me, "It's good that he wouldn't play with me today; I might have made him sick." Here I've been worried I upset her with my reaction to what happened, but heavier things weigh on her tiny heart. "I just want you to know that I love you, and that my computer isn't broken after all." "And don't you worry about him. He doesn't know how much fun he's missing." In the morning the laptop is dead. Overnight the acids corroded something essential. 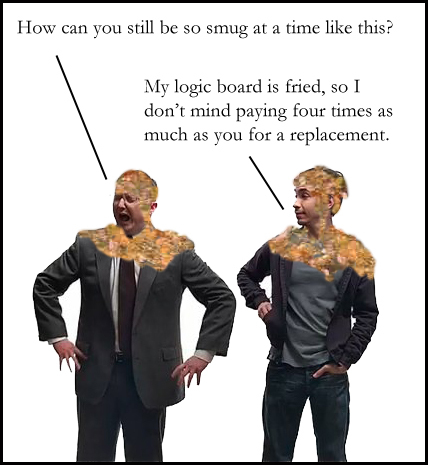 My brain can't help working through the justifications and rationalizations of replacing it. I hate nothing more than spending money. I mope for a bit on the couch and my daughter comes over and snuggles up to me and sits there for a while, vaguely patting me on the head and singing me a song. It was quite touching. And it was time I would have ordinarily spent typing. We keep our eyes on the kid every time she makes a sound, knowing that the only way this could get any worse is if she fills the car with that sickness. It turns out she's already over it, but when we get to Pittsburgh no one's there for dinner because my wife's stepbrother has overdosed on heroin and everyone is with him in the ICU. When his mother returns she sits with my wife in the kitchen over cold stuffing and an uneaten turkey and I listen to her fall apart, a bit drunk, her son in a coma with machines breathing for him, at a loss for what to do with the child she found choking on the vomit in his lungs and a needle still in his hand. It's just a goddamn computer, says the universe. You complain to the universe that she could have done it a few steps away; her aim could have been a bit to the right; she could have skipped the strawberries altogether. The universe gently presses your lips together, shushes you. You could have put the computer down for once. You watch your children sleeping in the car on the way back home. Your brain returns to the $1700 emesis. Years ago something like this might have made you angry. If your college roommate had done it, you might never have forgiven him. But how could you be mad at her? You might as well be mad at the wind. They will change you in ways you'd never expect. They will puke all over everything and it will do nothing to change the fact that you would tear out your own heart to see them go unhurt. The lingering odor of dried vomitus. You never knew love could smell this bad.